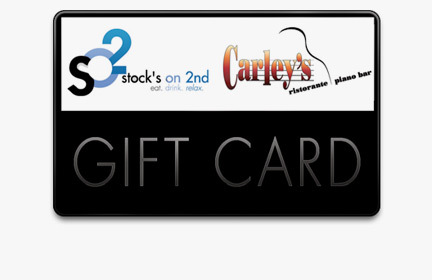 Give the gift of good taste with Stock’s on 2nd gift cards. They are the perfect gift for anyone who enjoys delicious food, great atmosphere and outstanding service. Our gift cards have no expiration date and there are no maintenance or non-usage fees. Gift cards are available for purchase at Stock’s on 2nd or click here to order your gift cards online.